Have had one for years and works great. Does not look pretty but for the price has great quality. A prepper's best friend. A classic and powerful Kukri design in a quality machete. BUYING MORE!! Just wish it came sharpened. 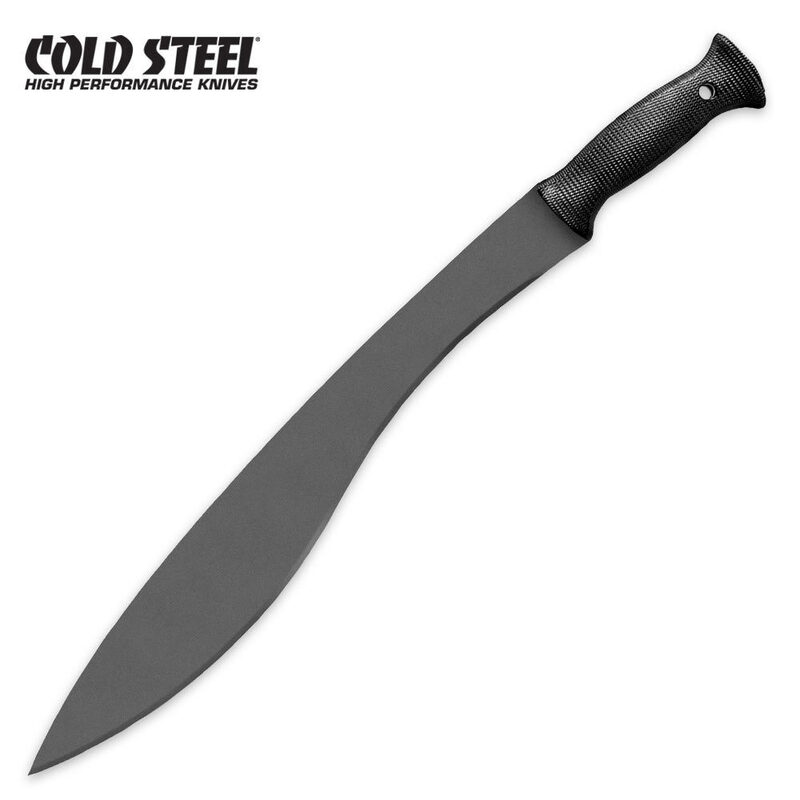 Awesome working tool; Iâ€™m glad to see this website selling cold steel products. Cold steel products like this one may not be as pretty as the others you see on the site but they truly are work horses that do a great job and are built to last. I have this machete and the smaller kukri both from cold steel and they are the ones I choose to take camping with me. They both chop better than a camping hand hatchet when chopping your firewood. The only thing better for chopping is your full size axe. If you are looking for a product for working and not for prettiness then this is an excellent choice. In fact Iâ€™m going camping this weekend and you better believe my two cold steel kukris both big and small version will be with me. Great product, does need to be sharpened because they come unsharpened but they sharpen real easy like the add states and gets really sharp easy. Sweet Kukri. If you're into real functional blades this is just about as good a slasher as you're going to get for the price, and beyond. Great Machete well balanced and well made. When i geat a machete the handle is normally lose and drives me crazy but even after putting it throw a few trees the handle is still holding strong.in fact the only bad thing about this blade is it took me 30 minutes to get a good working edge on it. the other thing was the sticker is a pain to remove. other than that this thing is great. I am really surprised with the quality of this machete. Combining the cutting power of a kukri with the length of a full size machete makes this thing an amazing tool. The blade has a good edge and is strong if a bit thin. Anyway it's a great deal. This has got to be one of my best machetes, it has good steel, good handle, easy to sharpen, and extremely tough. I won't even talk about the sheath though... I actually had another magnum Kukri that had a plastic insert in the sheath, but the one I have right now doesn't have it, but no big deal, it does the job. And the sharpness from the box isn't great, but like I said, you can easily get this extremely sharp. I love the feel of the handle, it's more grippy than most of Cold Steel's other machetes, and yet, still durable. And the weight is awesome, especially when you start using, you'll appreciate the weight, it's blade heavy and chops extremely well. And as a bonus, it also stabs good too if you sharpen the tip out of the factory grind. What left is there to say about this machete besides the awesome price?